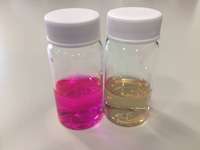 This novel, non-hazardous photocatalytic material effectively removes dye pollutants from water, adsorbing more than 90 % of the dye and enhancing the rate of dye breakdown by almost ten times using visible light. The researchers, led by Dr. Charles W. Dunnill and Dr. Daniel Jones at the Energy Safety Research Institute in Swansea University, reported their discovery in the Nature open access journal Scientific Reports. By heating the reaction mixture at high pressures inside a sealed container, the composite is synthesized by growing ultra-thin "nanowires" of tungsten oxide on the surface of tiny particles of tantalum nitride. As a result of the incredibly small size of the two material components - both the tantalum nitride and tungsten oxide are typically less than 40 billionths of a metre in diameter - the composite provides a huge surface area for dye capture. The material then proceeds to break the dye down into smaller, harmless molecules using the energy provided by sunlight, in a process known as "photocatalytic degradation". Having removed the harmful dyes, the catalyst may simply be filtered from the cleaned water and reused. 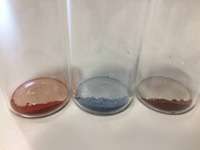 While the photocatalytic degradation of dyes has been investigated for several decades, it is only relatively recently that researchers have developed materials capable of absorbing the visible part of the solar spectrum - other materials, such as titanium dioxide, are also able to break down dyes using solar energy, but their efficiency is limited as they only absorb higher energy, ultra-violet light. By making use of a much greater range of the spectrum, materials such as those used by the ESRI team at Swansea University team are able to remove pollutants at a far superior rate. Both of the materials used in the study have attracted significant interest in recent years. Tungsten oxide, in particular, is considered one of the most promising materials for a range of photocatalytic applications, owing to its high electrical conductivity, chemical stability and surface activity, in addition to its strong light absorbance. As a low band-gap semiconductor, tantalum nitride is red in colour due to its ability to absorb almost the entire spectrum of visible light, and therefore extracts a high amount of energy from sunlight to power the degradation processes. The scientists responsible for the study believe that their research provides just a taster of the material's potential. "Now that we've demonstrated the capabilities of our composite, we aim to not just improve on the material further, but to also begin work on scaling up the synthesis for real-world application." said Dr. Jones. "We're also exploring its viability in other areas, such as the photocatalysed splitting of water to generate hydrogen." Asia is the largest source of air, water and land pollution. Asian rivers are so choked with plastic waste in some places you can't see the water. This will not be changing.